Nimble has finally launched its new All Flash Array: Predictive Flash Array. It took too long but, now that it’s out, it can’t be said they didn’t get it right! All-Flash is table stake now. Don’t have it? …well then, you can’t play! That’s the real problem. All-Flash still counts for a relatively small percentage of overall primary storage sales but, again, it is an option that customers want to have in every new project. It is true that prices are continuing to fall, and somewhere down the line your next primary storage system could most likely be an AFA, and that goes for smaller enterprises too. Nimble has been pressured a lot lately because of the absence of such a product in its lineup. But at least now they have a good array… ready to compete with all other AFAs, with interesting features and some good news coming for existing users of hybrid systems too. The product looks very dense compared to the competition. 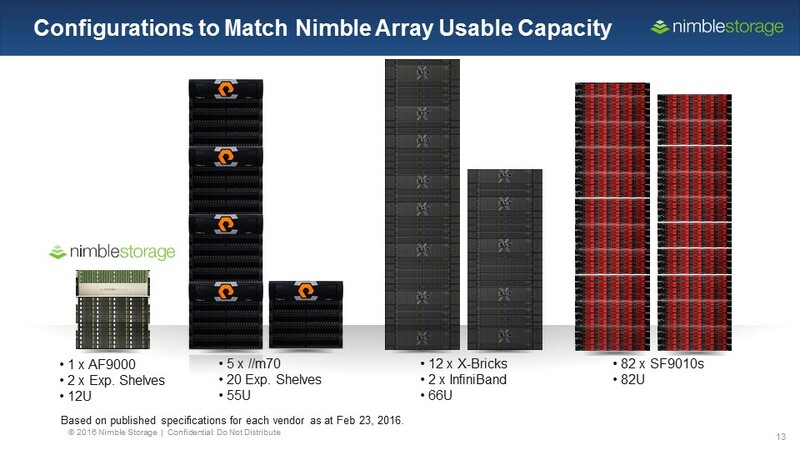 Nimble has also adopted an interesting disk tray design that can host both 2,5″ and 3,5″ drives and the performance output positions them in the right spot in terms of balancing between performance and capacity (we are talking about 2PB usable capacity and 300K IOPS for the single system, up to 8.2PB and 1.2M IOPS for a scale-out cluster of 4 nodes and 16RU). I actually don’t have an independent benchmark, but one of their customers who has been included in Nimble’s beta program, told me that the numbers measured in the field are aligned to what Nimble says in its slides. It’s interesting to note that the NimlbeOS remains exactly the same for both hybrid and AFA systems. And new features introduced today (like Deduplication for example) will be available on old (hybrid) systems too. And this is probably one of the reasons why it took so long to bring the AFA to the market. Another characteristic of Nimble’s new array that I really loved today is the scale-out capability of the product. Nothing new really, and not because of scale-out itself, but because you can mix different system types in the same cluster. It doesn’t mean that it is safe to span data volumes between different types of arrays, but it will be of help for transparent data migrations (especially if you have no success with functionalities like VMware storage vMotion). To be fair, this feature is not unique to Nimble in the market but again, it could be very useful in some environments. 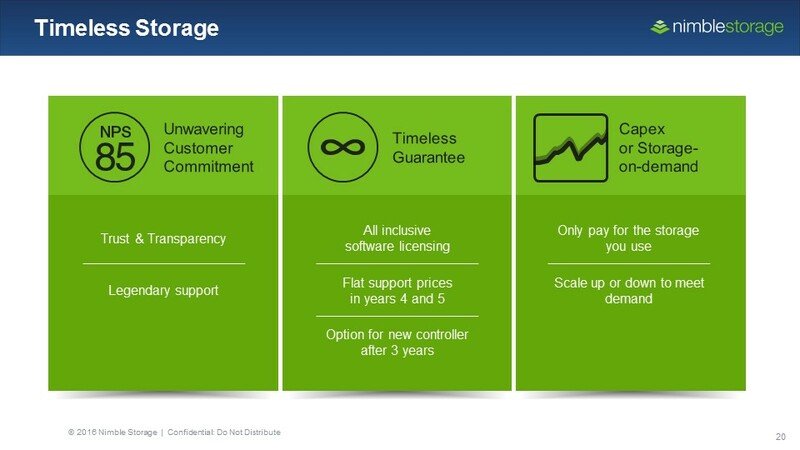 Nimble’s offer is also aligned with the competition when it comes to support, with a 7-year warranty on Flash Drives and other good support program characteristics. Again, not unique but great for end users. From my POV, a primary storage vendor must have an All-flash array today (and not only), but this is not the differentiator. Not anymore! Again, if we go through any single spec of this system and compare it to others in the market, I’m sure we will find that some could be better, others could be worse… the differentiation lies elsewhere. Looking at Nimble now, as far as I’m concerned the differentiator is in its Cloud-based analytics tool: InfoSight. This tool, thanks to the great amount of sensors continuously collected and the big data applications at the backend, puts the end user in the position of knowing what’s really going on with his/her storage system at any time, suggesting actions and helping the sys admin in his/her day to day job. This kind of help could contribute to driving down TCO while increasing system uptime, especially for small and mid-size organizations where resources are often constrained and sysadmins are forced to cover every aspect of infrastructure support. Nimble is investing a lot in this area, InfoSight is being continuously improved and the company is also looking at how to implement new features aimed at taking a deeper look at all infrastructure components and up in the stack, into the applications! All the good now happens in the upper layers: software, efficiency, sophisticated data services, QoS, integration, analytics and so on (which is not a cotracticion to what I wrote above!). I also think that all primary vendors should look much more carefully at secondary storage and cloud integration. Something that is still not happening… but that will be the next differentiator. Disclaimer: I was invited to this press event by Nimble and they paid for travel and accommodation, as well as for a lot of food! I have not been compensated for my time and am not obliged to blog. Furthermore, the content does not get reviewed, approved or edited by anyone other than the Juku team. Juku was commissioned by Nimble in 2015 to write a paper. PreviousWhat Data-aware storage can do for you?